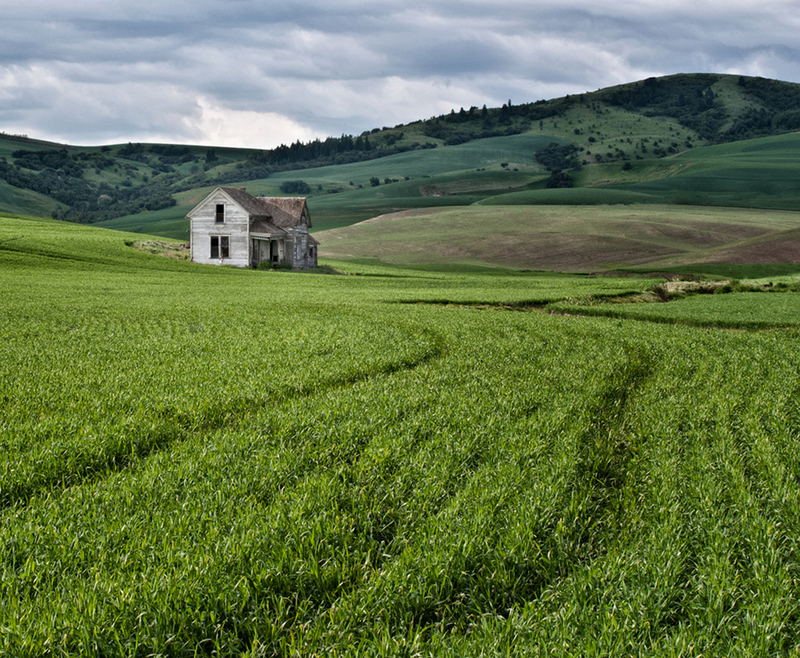 This derelict wooden farmhouse stands in the middle of a wheat field in the Palouse area of Washington State. It was constructed in the 1840s and finally abandoned, by descendants of the same family who had originally built it, in the 1960s. I shot various compositions of the farmhouse, isolated among the wheat and framed against the hills in the distance, but was not satisfied with any of them. It was only when I started walking around the edge of the field that I came upon a series of tracks, made by agricultural machinery through the growing wheat, which led in the direction of the farmhouse. Using the tracks as an element in the composition offered the possibility of creating a more effective image. To the photographer’s eye, tracks like these are lines and line is one of the key elements of design. Different shapes of lines evoke different emotions in us. We perceive curved lines, which dominate in nature – streams, rivers, beaches, coastlines, dunes and hills – to be soft, gentle, restful and relaxing. In the blog image, not only do the curved lines through the wheat field invite the viewer’s eye to enter the image through the bottom of the frame, they also guide the eye towards the main subject of the composition: the farmhouse. Their curved shape adds a feeling of peacefulness to the image, which complements the tranquility of the farmhouse standing, deserted, amid the empty rural landscape. Mies van der Rohe (1886-1969), the German-American architect, who was the last director of Berlin’s famous Bauhaus school of design and who was widely regarded as one of the pioneers of modern architecture, asserted, “God is in the Details”. By contrast, it is also claimed that “The Devil is in the details”, a saying ascribed to the American investor Warren Buffet, although he was referring, more prosaically, to the first contract he ever signed, rather than to an art form. For myself, I have never found evidence of the existence of either these two gentlemen, in details or anywhere else. However, as a photographer, what I have found in details is beauty. One of my favorite places to photograph in the Washington area is Kenilworth Aquatic Gardens, an area of tidal marshes fed by the Anacostia River. For two weeks each summer, the gardens look resplendent under an abundant display of lotuses and lilies. Walking into the gardens, one is greeted by the overwhelming sight of thousands upon thousands of lotuses, in every imaginable shade of pink, white, green and yellow. As a photographer, I find the challenge of capturing beauty on such a scale quite daunting. I know that, if I take a photograph of a huge pond full of lotuses, not only will I fail to capture the majesty of the scene, but I will also produce a mediocre photograph. Herein lies one of the key lessons that I have learned about photography: it is not a literal art; it is a representational one. Put another way, just taking a straight, or literal, photograph of a beautiful scene is no guarantee of producing a beautiful photograph. This is where details come in. In order to unlock the beauty in such a vast scene, I find that I invariably enjoy greater success if I go small and look for a tiny vignette that encapsulates the beauty of the whole. 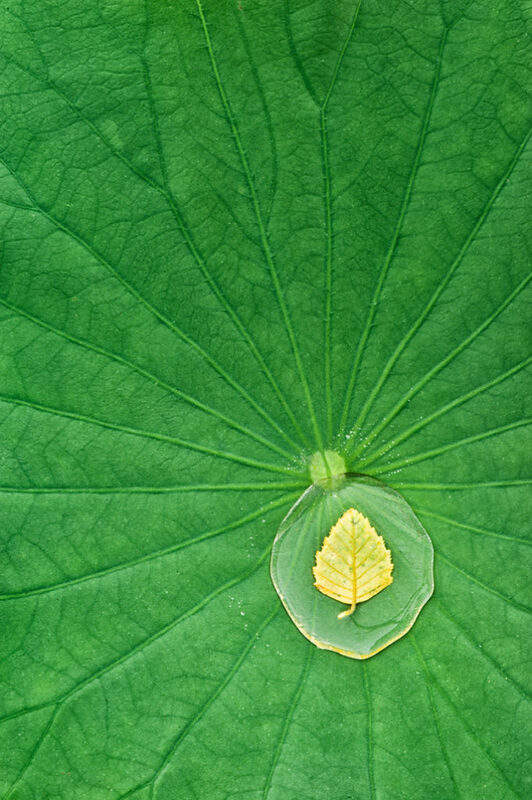 And, so, while photographing the lotus ponds at Kenilworth recently, I came upon this beautiful little scene: a tiny, yellow leaf suspended in a small pool of crystal clear rainwater that had been captured in the bowl formed by a lotus leaf. Beauty is in the details. Perhaps alongside God and the Devil. The human eye sees light waves in the range of 400 nanometers (a measurement of the length of a light wave equal to one billionth of a meter) to 700 nanometers (nm). We see light waves of 400nm as the color violet and those of 700nm as the color red. In between, we perceive the range of light wavelengths as a smoothly varying rainbow of colors, known as the visual spectrum. Light waves shorter than 400nm and those longer than 700nm are invisible to the naked eye. Cameras, however, can “see” light waves outside of our visual spectrum. Just above our visual spectrum, in the range of 700nm to 1400nm, is the near-infrared (IR) spectrum. Cameras can be adapted to capture light in this spectrum, offering the photographer some interesting creative options. For IR work, I use a Nikon D200 camera converted to record light at 720nm, which is known as a standard IR conversion. While photographers normally avoid shooting in bright sunlight, preferring to seek out the “golden hour” of early morning or evening, IR photography works best in bright sunlight. This is because, when sunlight strikes green leaves and grass, the chlorophyll in the vegetation reflects huge amounts of infrared light, which is captured by the camera’s specially-adapted sensor and rendered as a ghostly white. The resultant image can then be processed either as a color image (within the limited range of colors available in that part of the light spectrum) or converted to black and white (B&W). To my eye, an IR image converted to B&W, such as the blog image, produces a look which is different from normal B&W photography (shot in visible light). So, it offers the photographer a unique form of visual expression. Not content with shooting IR, I have also been experimenting with High Dynamic Range (HDR) photography in IR light. HDR permits the photographer to capture a greater range of light – from bright highlights to dark shadows – than the camera’s sensor can capture in a single exposure. 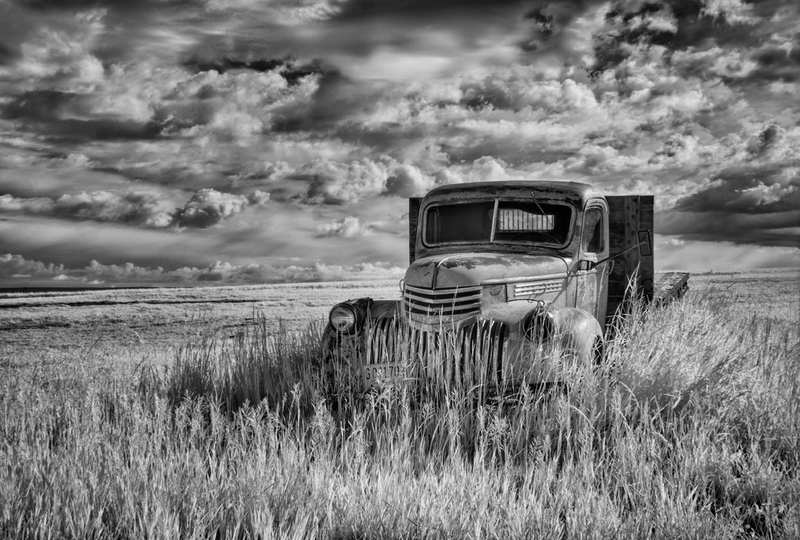 For this shot, the camera could not capture both the bright reflections glinting off the chrome grille of the truck and the shadows cast on the grass. This image was made by shooting a series of three exposures shot at different exposure values (f25 at 1/20th sec, 1/13th sec, and 1/5th sec), then merging them into a single, correctly-exposed image in post-processing, using the Nik HDR Efex Pro 2 plug-in for Photoshop. In processing the image, I increased the tonal contrast and structure to make the sky really pop. Of course, it helps if you have dramatic clouds in the sky to start with. This image was shot in early June, 2013 in the Palouse area of Washington State, which has some of the most dramatic skies to be found anywhere.